Shiraz by Paul Osicka of Heathcote. The palate is seductive, a tight integration of complex fruit flavours, currants, rhubarb and cherry with the savouryness of turkish caradmon coffee and five spice over a fine construct of smokey, cocoa oak and firm supportive tannins. One of Heathcote's longest established winemakers, Paul Osicka planted his vines in the 1950s, when Heathcote as a winegrowing region was but a twinkle in the eye. Osicka's Majors Creek Vineyard enjoys a later budburst than most sites around Heathcote, by virtue of a slightly cooler climate, which translates into grapes with heightened levels of flavour. A chewy textured, intensely flavoursome Shiraz. Grown without irrigation on sandly loam soil over quartz and red ironstone gravels, the vineyard is managed according to organic principles without the use of herbicides or insecticides. The vines are hand pruned to balance the yield and the grapes are hand picked to achieve optimum fruit quality. These factors combine to produce small intensely flavoured and coloured fruit necessary to make premium wines. The principal red wine produced is Shiraz followed by Cabernet Sauvignon and Merlot. The vineyard and winery are situated in Heathcote, and due to the close proximity of the Graytown Box-Ironbark State forest, it is common to find all manner of native animals amongst the vines, including kangaroos, wallabies, emus, lizards and echidnas. The vineyard is non-irrigated and deliberatley kept to a low yield ensuring the berries are smaller and more intense in colour and flavour. A number of varieties are gronw including Shiraz, Cabernet Sauvignon, Riesling, Merlot and Roussane, with the Shiraz vines dating back over 45 years. The soil consists of a sandy loam and gravel topsoil with a crushed quartz and red ironstone buckshot gravel underlay which makes for excellent drainage. Traditional methods are used to manage the vineyard with the grapes being carefully handpicked, and the vines painstakingly hand pruned. Conscious of their impact on the environment and wine, no herbicides or pesticides are used in the vineyard, instead organic fertilisers are used to provide the vines with nutrients. The winemaking is also a hands on affair with winemaker Paul Osicka personally implementing each stage of the process. Extensive use is made of new oak barrels in the maturatin of the wines, and is an expensive although important part of the quality process. 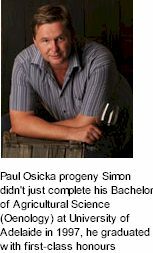 Simon literally grew up surrounded by full-bodied, red wines produced at his family's Majors Creek Vineyard, today known as Paul Osicka Wines. Not surprisingly, for someone immersed in wine from birth, Simon didn't just complete his Bachelor of Agricultural Science (Oenology) at University of Adelaide in 1997: he graduated with first-class honours. Following cellar-hand work and two overseas vintages in Canada and Italy, he joined Houghton Wine Company in 1999 as Assistant Winemaker at the company's Swan Valley site. At Hougton he gained immeasurable experience producing prestige red wines under the Gladstones and Jack Mann labels. The following year, Simon was promoted to Winemaker and completed a second 1999 vintage in Sicily at Casa Vincolia Calatrasi. Returning to Houghton, he transferred to Nannup in 2001 and worked with the Senior Winemaker Manager, Gretel Friend, to complete the site's inaugural vintage. As the most technologically-advanced winery in the region, it provided both enormous opportunities and challenges. Within seven months, Simon was promoted as the site's Senior Winemaker Manager. In late 2005, Simon went to Leasingham as Winemaker Manager and is now responsible for the day-to-day workings. Simon has judged at both the Mount Barker Wine Show and West Australian Wine Awards.